I seems like every like every new product that is demoed at CRETEC in Japan this week is cooler than the last. We’ve reported on bendable OLED screens, augmented reality eyeglasses and WiMax 2 already, but this news is pretty slick as well: a dual touch screen clamshell mobile phone from Fujitsu, that allows you to rotate each of the screens 90 degrees (i.e. to be horizontal) and can run different applications on each screen. As if that isn’t cool enough, these aren’t puny screens either – one is 3.4 inches and the other is 3.5, both with 480 x 960 resolutions. That’s a lot of screen space for one phone. 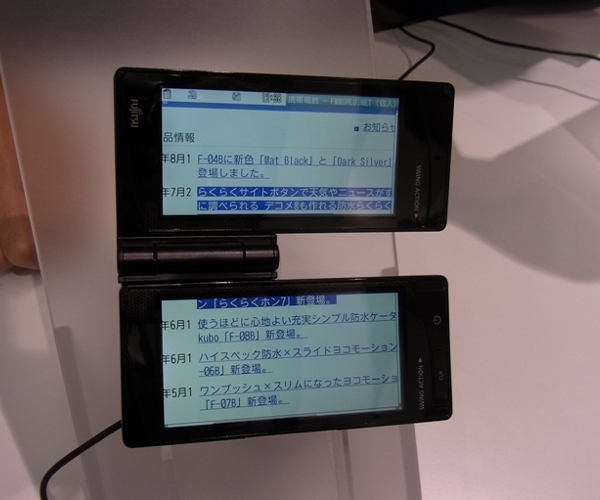 While the prototype that Fujitsu demoed was running Symbian, the phone can also run Android, so that is great news. On the down side, the phone uses about 1.5 more power than a ‘normal mobile phone’ according to Fujitsu (though we aren’t sure what Fujitsu considers ‘normal’), but that’s pretty reasonable considering that it’s using two screens instead of one. No other specs were released, but we’re going to guess that the phone must have some serious hardware to be able to run two apps on split screens at once. So what do you think of this form factor? Would you get one of these if all the other specs were killer and the price was right?